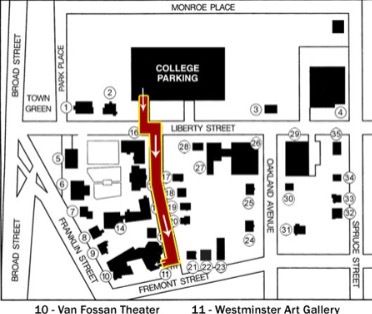 You may park in the school parking lot on weekend performances and follow the arrows to the Westminster Arts Center. You may NOT park in the bank parking lot directly across the street from the Westminster Arts Center. This lot is privately owned and cars that are parked illegally will be booted. Exit 148 (Bloomfield Ave.) At end of Ramp, continue across Bloomfield Avenue to next light. Make a left under GSP and continue up Franklin Street past the police station and fire station. Go through the light and stay to the right when the road splits (near the Steakhouse.) Westminster Arts Center is located on the next corner at Fremont Street. 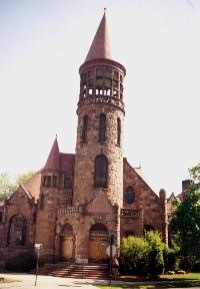 The building that was previously a church on the corner of Franklin & Fremont. Exit 148 (Bloomfield Ave.) Exit GSP and continue on ramp. After merge, make right at light and turn right at next light (Municipal Building on left) onto Franklin Street. Follow directions above. Rt. 3 to the GSP Southbound. See Above. Take Rt. 287 to Rt. 80 East. Take 80 East to Rt. 280 east to GSP Northbound. See Above. The sign in front of Westminster reads "The Robert V. Van Fossan Theatre." There is street parking in Bloomfield as well as the school parking lot at Liberty & Austin Pl (behind the theatre) for all performances. Patrons may not park in the bank parking lot directly across the street from the theater. Anyone parking there is subject to being ticketed, booted or towed. Decamp bus lines Nos. 33, 44, or 88 from Port Authority Terminal to Broad and Liberty Streets, Bloomfield. Walk one block east on Liberty Street to College. Bloomfield Station is located on the Montclair Branch of the Morris & Essex line. From Penn Station, NYC there is a direct connection to Bloomfield. From the Bloomfield station walk north on Glenwood Ave. toward town center, cross Bloomfield Avenue and follow Broad Street to Liberty St.